The Complete Kerala Lotteries Live Results and Updates Blog. The "Karunya" number KR-366 draw held on 13th October 2018 at 3:30 PM in Sree Chithra Home Auditorium. 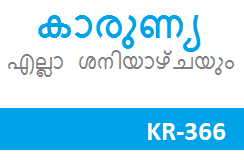 The Kerala governments lottery department publishes Karunya (KR-366) results through official website www.keralalotteres.com and www.kerala.gov.in by 04:30 PM. Get today's latest Karunya Lottery series number KR-366 result live from this page as fast as possible. Congratulations to the Karunya (KR-366) winners, We advise the winners of Karunya series number KR-366 to verify your winning numbers with the Kerala State Government Gazatte results and try to surrender the winning tickets within the period of 30 days to claim your prize for Karunya (KR-366) tickets. The Karunya (KR-366) is a weekly lottery conducted by Kerala Government on every Saturday. Kerala lottery "Karunya" number KR-366 draw held on 13Th October 2018 at 3:30 PM in Sree Chithra Home Auditorium, Pazhavangadi, East Fort, Thiruvananthapuram, Kerala (PIN Code - 695023). ** The Upcoming Karunya Lottery Result Will Be Held on **** 20 October 2018. Check Here for Karunya (KR 389) Live Results.. Check Here for NIRMAL WEEKLY (NR 114) Results..
DISCLAIMER : This website or webmaster is not affiliated to the kerala government, lottery department of Kerala or any of the lottery agents in Kerala. We advice all visitors to verify the winning numbers through Kerala government Gazette or check the official website of Kerala state lotteries (keralalotteries.com). We take care of the uploading/ publishing of Kerala lotteries results to be accurate as possible. Any how, we can not guarantee the accuracy of the results.